The Bureau of Labor Statistics reported the economy added 250,000 jobs in October as the employment rate or Employment-to-Population Ratio (referred to as EPOP, or the percentage of adults with jobs) rose 0.2 percentage points to 60.6 percent, a new high for the recovery. The strong October job growth was largely a bounce back from a hurricane-weakened September number of 118,000 (revised down from 134,000). The three-month average is 218,000, roughly in line with growth over the last four years. While the unemployment rate was unchanged in October at 3.7 percent, the strong economy is apparently still pulling more people into the labor market. The EPOP for prime-age workers (ages 25–54) rose by 0.4 percentage points to 79.7 percent, a new high for the recovery. This is 0.8 percentage points above the year-ago level. The increase was for both prime-age men and women, with the EPOP for men now 0.5 percentage points above the year-ago level and women up by 1.2 percentage points. While the EPOP for prime-age women is above its prerecession peak, it is still down by 1.5 percentage points from its peak in 2000. The EPOP for prime-age men is still 1.8 percentage points below its prerecession peak and more than 3.0 percentage points below its peak around 2000. The tighter labor market is showing some dividend in wage growth. The average hourly wage is up 3.1 percent over the last year. Wage growth looks to be on an upward track. The annualized growth rate comparing the last three months (August, September, October) with the prior three months (May, June, July) is 3.6 percent. Manufacturing workers do not seem to be benefitting from this tightening, with wage growth of just 1.5 percent over the last year. In terms of employment, less-educated workers continue to be the main beneficiaries of recent job growth. Over the last year, the EPOP for workers without high school degrees is up 1.5 percentage points. For high school graduates, it is up by 0.9 percentage points. By contrast, the EPOP for workers with college degrees fell 0.4 percentage points over the last year. While the news in the household survey is overwhelmingly positive, there were a couple of discouraging data points. The share of unemployment due to voluntary quits, a measure of workers’ confidence in the labor market, dropped to 11.9 percent. This compares to an average of almost 14.0 percent and a peak of over 15.0 percent in 2000. There also has been a drop of 156,000, or 1.0 percent, in the number of workers who report being self-employed over the last year. This could be due to uncertainty over health insurance. The share of the self-employed rose following the implementation of the Affordable Care Act. With its future now in question, many workers may not want to take the risk of leaving jobs that provide health insurance. The job gains in the establishment survey were broadly based. Health care led the way, adding 35,600 jobs. There appears to have been a pick-up in job growth in the sector, as it added an average of 33,900 jobs over the last three months. This compares to an average of 26,900 over the last year. Manufacturing added 32,000 jobs in October, while construction added 30,000. The former is somewhat more rapid than the average growth of 25,000 jobs over the last year, while the latter is close to the 27,500 average. Retail added just 2,400 after losing 32,400 in September. Still, employment in the sector is up by 36,600 over the last year. Restaurants added 33,500 jobs, after losing 10,000 in September, most likely as a result of the hurricane. The two-month average of 11,750 is below the 17,000 average for the last year, possibly indicating that low-wage employers are having difficulty finding workers in a tight labor market. While the mining sector as a whole added 5,100 jobs in October, the coal industry lost 200 jobs. Employment in the sector is now down by 100 from year-ago levels. This is an overwhelmingly positive report. 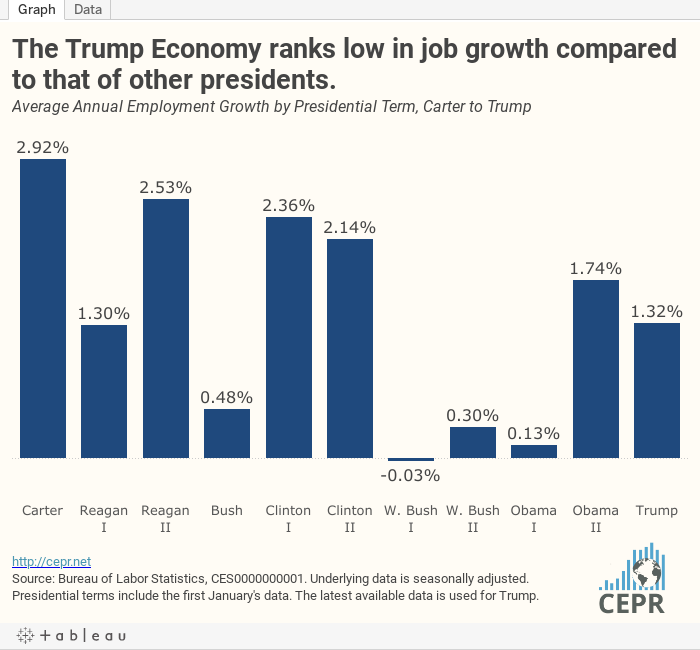 It indicates that the pick-up in job growth that began seven years ago is continuing, with the economy adding well over 2 million workers a year. This rapid pace of job growth is pulling more workers into the labor market, which is finally getting tight enough to produce substantial wage gains. A Kentucky program trains former coal miners in energy efficiency — and rallies distressed communities. The average hourly wage in manufacturing rose just 1.7 percent in the last year.